I recently visited Ireland for a SATW travel writers and photographers conference. 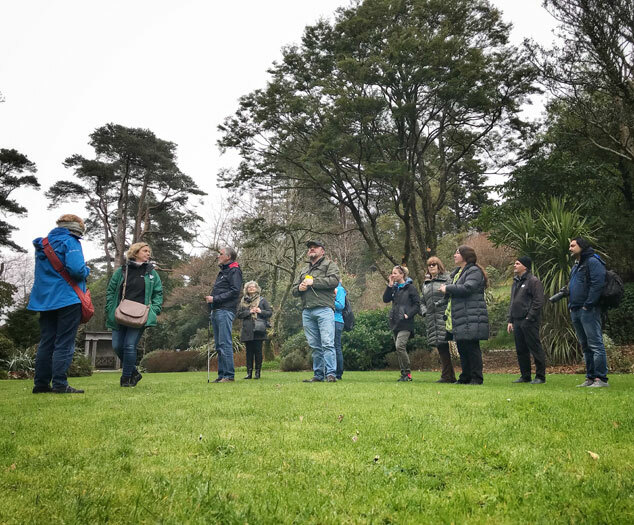 As part of the post-conference tour I journeyed to Glenveagh Castle and National Park and discovered gardeners struggling to restore balance in plant species. Glenveagh Castle was originally owned by John George Adair. His wife Cornelia Adair became owner of the castle when he died suddenly 1885. Cornelia took over running the estate and unaware of the dangers of invasive species brought in red deer. While popular with hunting parties the species decimated Irish forests. Trees interrupt the view across Glenveagh Castle Lake only in a deer-exclusion zone or near the castle where it appears tourists or gardeners make deer feel unwelcome. While it’s possible to kill the invaders there will be no success unless native plants are reintroduced shortly thereafter. “It’s more about vegetation management, not just killing plants,” clarified O Gaoithin. The result is a unique blend of garden and natural fauna within a national park and a reminder all of us share responsibility for restoring balance to natural environments. “Our job from now on is to garden the planet responsibly,” O Gaoithin concluded before waving and striding away in heavy work boots, his mind already back on restoring environmental balance. To learn more about the castle gardens click here. Restoring Balance in Ireland’s Glenveagh Castle Gardens – Click to Tweet. My friend, @reinventure, recently discovered there is a problem with invasive species in the gardens in Ireland. Read on for more: Click to Tweet. Did you know that introduced animal & plant species are one of the world’s biggest challenges? My friend, @reinventure, shares why here: Click to Tweet.